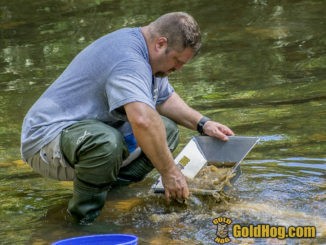 December 5, 2017 admin Gold Panning, Gold Prospecting, Today's News & Picks Comments Off on World’s Fastest Gold Pan? The World’s Fastest Gold Pan? For over 200 years the “gold pan” really hasn’t changed that much. Let’s face it… you take dirt, put it in a pan, shake and wash, the process is fairly simple but is also slow and tedious. Nowadays it’s often the last choice of prospectors due to its slow production. However after over two years of playing, designing, testing, and prototyping, a new gold pan is hitting the market that really changes the way people pan and the SPEED at which they do it. 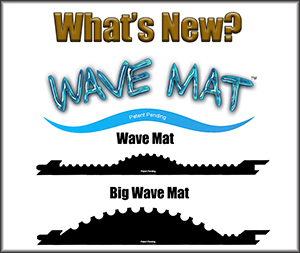 The new FLOWPAN™ from GoldHog® has a lot of new features and innovation within it. But there’s also one benefit, that until all the field testing was done, was really unknown. It’s FAST… and could quite possibly be the world’s fastest gold pan for raw / unclassified material. 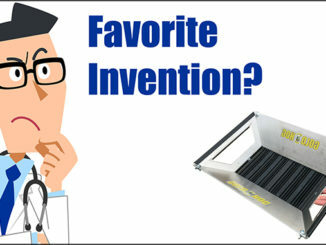 In development and prototyping for over two years by Doc, the founder of GoldHog®, the FLOWPAN™ is a patent pending, portable, gold pan that uses “cross flow technology”. The new cross flow action, similar to the washing action of a sluice, aids the panner with washing away the non-gold material, which must be removed with every pan of dirt. At the end of the “wash down” all that remains in the matting at the bottom, is mostly a small amount of black sand and gold. The FLOWPAN breaks down into a small five piece travel size that fits into your pack. 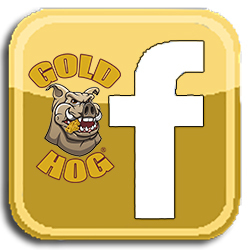 Making a portable gold pan really is what started the whole development according to GoldHog®. With the use of only six wing nuts and about 90 seconds, it expands into a large, sturdy, working gold pan. It goes from very compact, to a VERY large working pan. It wasn’t until all the field testing was done that Doc realized something, the FLOWPAN™ worked raw material faster than anything he had used before. Most gold pans comfortably hold about ½ gallon, a large shovelful, of raw pay / dirt / gravels. Being unclassified, with large and small rocks still in the material, the panner must constantly stop and remove these rocks every time they stop and wash the pan. This “stop and clear” hand action slows down the process greatly. However, the new FLOWPAN™ virtually eliminates all the time wasted from this hand clearing or even classification process. This means that a pan full of unclassified material can be worked down in roughly 10 – 20 seconds. A five gallon bucket of raw pay can easily be worked in about 10 minutes. 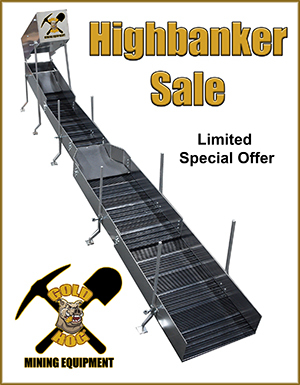 This is a HUGE time savings when out scouting areas and prospecting for gold rich grounds. Now realize this when it comes to SPEED. We’re not talking about a “little improvement”… we are talking about the difference between night and day. I was able to witness Doc, who is a very fast, experienced panner, do a comparison. He took two five gallon buckets of raw pay and worked them with two pans. One a traditional, round gold pan and the FLOWPAN. The FLOWPAN was able to process the bucket in in about 7 minutes. Keep in mind that this was raw, excavated, unclassified, material. However, when it came to the traditional gold pan, things got really slow. He was only able to put about a quart of material in the pan and the process of washing, pausing, and pulling out rocks was rather tedious. After about 20 minutes he was only halfway done. He needed to take a break and stretch his back. “Gosh darn it… that’s a whole bunch more work.” He exclaimed leaning back and stretching his back. “I’m about done with this crap.” He continued on with the exercise and another 15 – 20 minutes later finished the bucket. The results / yields from the two panning tests were almost identical, a few small specs of gold, but the TIME FACTOR was such a dramatic difference, I was really, REALLY, impressed. Roughly 1/2 an hour for the traditional round gold pan, and about 7 minutes for the FLOWPAN. This exercise was an eye opener for me as well and I don’t think it really SUNK IN… until later that night when I was thinking of the two methods and the difference. I really never thought about how fast the FLOWPAN was until I saw the exact same material and amount of material being worked the traditional way with a traditional gold pan. 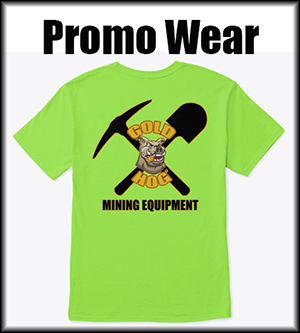 When it comes to gold prospecting, there is no “magic tool”, however there are products that truly show ingenuity and improve the we prospect. 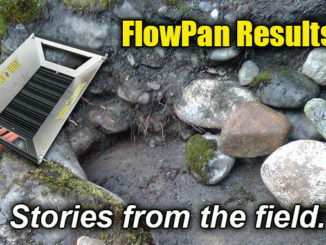 In my opinion, the FLOWPAN is one of the best developments / products to hit the prospecting market in years. Truly innovative and a great performing piece of equipment. 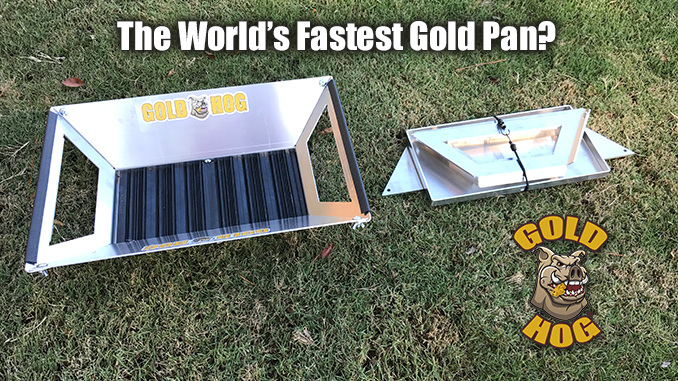 Because it eliminates the need for CLASSIFYING, a time consuming process, I have no problem giving it the title of “The World’s Fastest Gold Pan”. One side note… I think think this pan is an EXCELLENT testing tool for commercial ops. Testing pay BEFORE you run it is a vital step many miss and this pan can sample raw pay very quickly. It’s also a FANTASTIC prospecting tool for scouting new areas and identifying gold deposits levels. Mike, the author, has been involved with prospecting and commercial operations for many years. He currently works with commercial operations specking out their equipment and helping them to improve capture rates via design of the sluices and capture systems. he has worked with operations in the US and 20 different countries.